Five of United Way California Capital Region’s donors and volunteers were honored by the local nonprofit last week for their commitment to United Way’s Square One Project that is ensuring local students graduate from high school prepared for success in college and beyond. Honorees included Al Goldberg of Natomas, Amber Lovett of East Sacramento, Jim Shetler of Galt and Sandy Smoley of Midtown Sacramento. Del Paso Heights-based Dr. Pepper Snapple Group was United Way’s fifth honoree. Goldberg was named Young Leaders Society Member of the Year for his dedication to United Way’s Young Leaders Society by reaching out to new members, promoting events and bringing ideas to the group. Lovett received the Women in Philanthropy Member of the Year Award for her work getting United Way’s Women in Philanthropy off the ground 15 years ago and her continued dedication to the group as a donor. Shetler received the Boje and Price Award for Outstanding Volunteerism for his service on the group’s board of directors creating a five-year strategic plan in addition to being a top United Way donor. Smoley received the Frances Wisebart Jacobs Live United Award for her longtime commitment to United Way since 1967 through a women’s group, leadership on the board of directors and donations to United Way’s Women in Philanthropy. 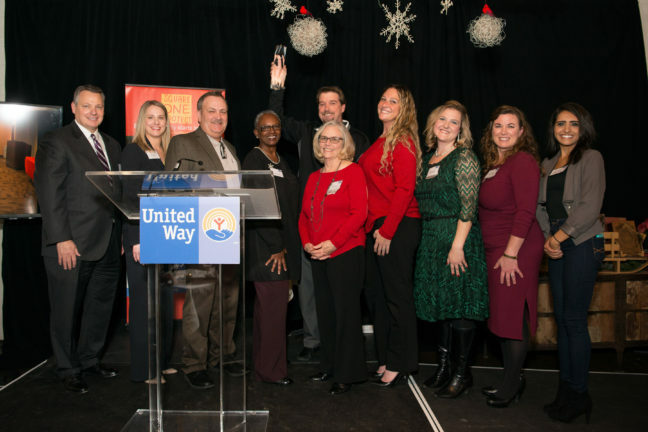 Dr. Pepper Snapple Group was honored with the Cornerstone Award for achieving outstanding results in the company’s United Way campaign and making volunteerism and community engagement part of its company culture. The company has contributed countless volunteers and more than $273,000 over the last five years. United Way California Capital Region has launched the Square One Project, a 20-year promise to significantly increase the number of local students who graduate from high school ready for success in college and beyond. Through nine decades of work and research across Amador, El Dorado, Sacramento, Placer and Yolo counties, the local United Way now believes ending poverty starts in school and is working to ensure kids meet important milestones for success in college. To donate or volunteer, visit www.yourlocalunitedway.org.